For $12,995, Is This G-Wagen Holier Than Thou? Today's Nice Price or Crack Pipe 280GE was built by Austria's Steyr-Puch, although its abundance of rust may make it more like Swiss cheese. Will that affect your opinion of its price, which is of course in American dollars? 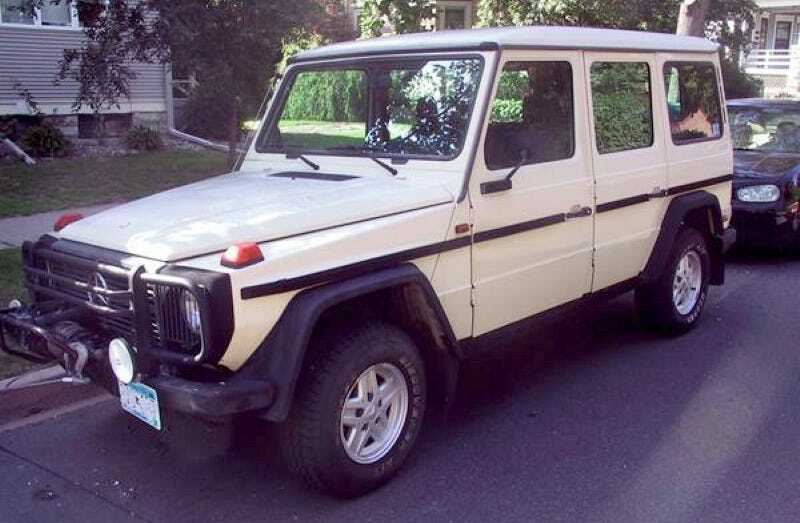 Before the G-Class became the iconic and ironic vehicle of choice for many of Hollywood's tree-hugging environmental lip-servicer elites, it was a five o-clock shadow of a truck, rough, Teutonic, and eminently capable. Originally designed for the Military, over the years the G has evolved from dependable mud-humper to one of the more dominant expressions of conspicuous consumption one might find slumming on Rodeo Drive or hauling the errant Kardashian to and fro. In actuality, with 35 years of production under its belt - making it the longest serving product in the Benz portfolio - the G-Class serves multiple masters. The current V8-powered blingtastic editions provide one of the more common celebrity mobility conveyances, while the older - and in the U.S., more grey market-ier - editions are sought out by those who appreciate their NORAD Bunker-like build quality and legendary go-anywhere capabilities. Plus, the older ones are just so damn cool looking. This 1985 280GE falls into that latter category. This isn't the sort of G you'd see the prime spotted by the valet in front of Bouchon, but you could totally rock it antiquing in the Hamptons or sleeping in the back of it at Lime Rock, as it's got some pretty broad bona fides. It also has a long list of sad-making issues which are detailed here. For those to busy to click and read, I'll top-line: shimmy-shimmy cocoa puff, odo no-go, wonky winch, bump stop so you can't drop, window crank out of rank, wiper no wiping! indicator see you later, and beat seats. Those are all small schnitzel compared to the biggest issue however, which is... rust. Duh, duh, duuhhhh. The Geländewagen is a stout beast there is to question, but just as Superman has his kryptonite, and Justin Bieber his personality, the G-Class has rust as its most confounding nemesis. Here that road rot has taken up residence in the driver's side footwell, on the back quarter, and overall pimpling like a stressed-out teen. So a down vote to all the oxidization, but a hearty thumbs up to the seller for being so forthright in noting its extent. With all the badness out of the way let's look at this truck's positives. It does appear to be cleanly titled in Minnesota, so that's a good start. Then there's the mill. The 280 in 280GE means this G sports the M110E double overhead cam straight six. That's 2,746-cc in displacement and around 150-bhp in output. That's good too. The ad notes that this one was rebuilt about 5 years ago with what the seller says were bigger pistons. Hopefully those went hand in hand with a rebored block or I would imagine things would have to be a pretty tight fit. The seller also claims 17 mpg from the truck in mixed use, which isn't too bad considering these have the aerodynamics of an open parachute. Aside from the rumored rust, the body seems to be in good shape, and the Aryan white (sorry about that) paint looks to be serviceable. On the inside it's remarkable how much these early Gs look like Isuzu Troopers, what with the beige plaid upholstery and all the flat glass. It is of course 4-wheel drive with locking diffs and will go pretty much anywhere. Whether or not you think it should go into a new owner's garage will have a lot to do with its $12,995 price. What do you think, is this G so money? Or, is this a Geländewagen that's not up to braggin'?